As you know, the author, Arthur Conan Doyle’s most famous characters, “SHERLOCK HOLMES” sends Holmes and his stalwart partner Watson on their latest challenge. Revealing fighting skills as lethal as his legendary intellect, Holmes will battle as never before to bring down a nemesis and unravel a deadly plot that could destroy the country! 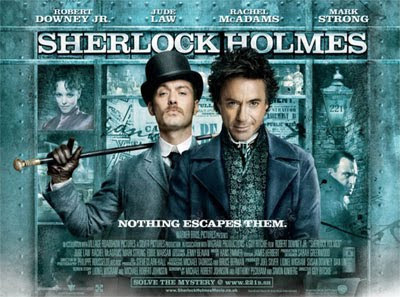 Before 12 midnight on 31 Jan, my family and I decide to watch a long awaited of movie "Sherlock Holmes". :P Since I am teenager, I always to read more stories about her and Dr. John Watson. I really love it! But, it is really different than what I read a novel. O_o Sherlock Holmes and Dr John Watson always act as cool, but they also argue each other, like old couple but they are very close in their bond of friendship. That is why they are best friend. 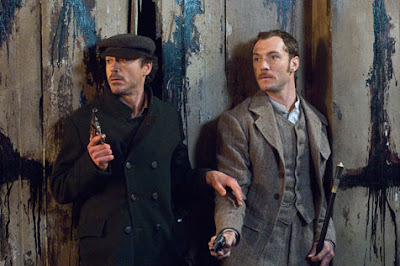 Dr. Watson never leave Holmes's side when he worried Holmes will face more dangerous mission...I think that Holmes sure need Dr. Watson's help when he is alone to solve mystery about Dark Magic. Holmes is very weird when he is very thinking so deeply and like to try examine about how magic and science can battled it all out...that is why he try to test himself. He needs to understand what is his enemies' mind.... At least, his brain is still working and the elements of criminologist remain intact...Amazing, his skills are use of astute observation, deductive reasoning! 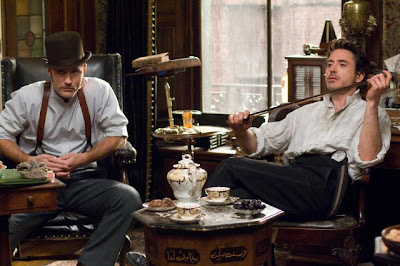 Sometimes, you are seeing humour, action, mesmerizing dialog from Holmes. :D For example, he always show his humour action and talk jokes with Dr. Watson so, I think that he wants to bully Dr.Watson when he is in good mood. If he is in bad mood, he always act so messy, and love to do weird things.. Holmes is really very intelligence guy who think his action 1st before he does..but, he is really fast when he wants to find the answer so quickly! So, he is very risk taker. Wow, many people wear black during twentieth centuries! They don't have more knowledges about science that compared with today. They always focus on more Politics and Economic in London..
Ritchie is all about the whooshing and headbanging, leaving no space between Holmes' words to savor their meaning. Downey is irresistible. The movie, not so much.